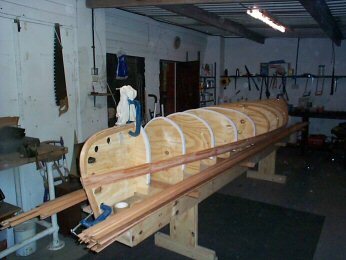 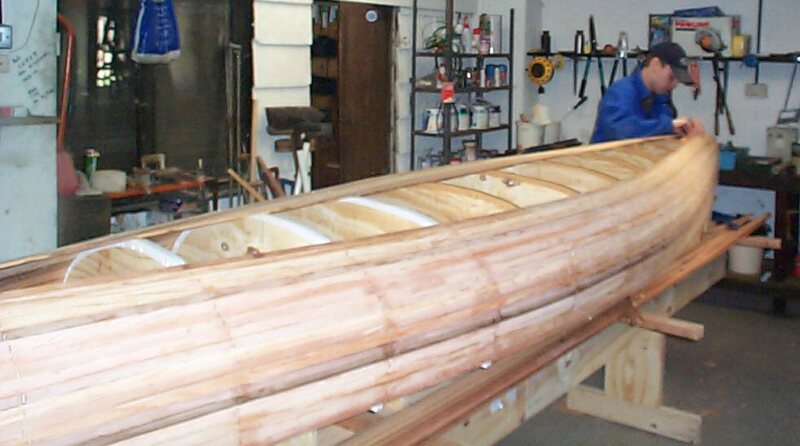 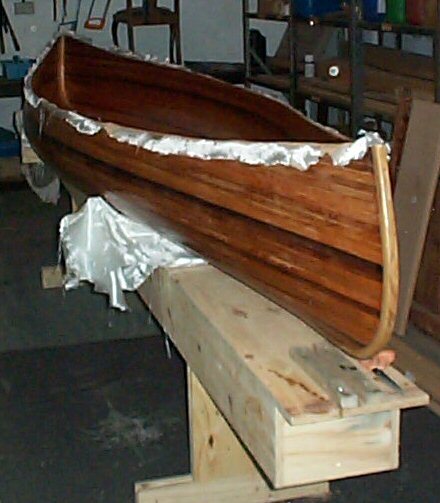 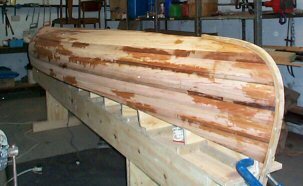 15/03/03 - We steam bent 3 pieces of cedar and 3 pieces of ash together to make the inside and outside Stems for each end. 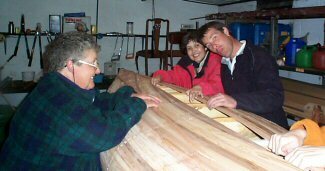 We used a tea urn and a pipe for this. 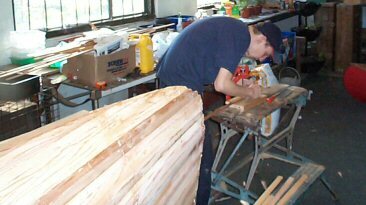 05/04/03 - We have started to put the cedar strips on; stapling the strips to the mold and glueing them together with wood glue. 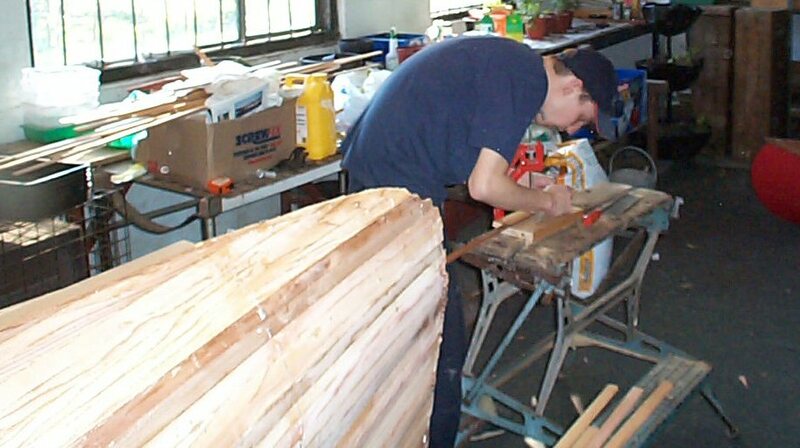 Me, shaping the stems so the cedar strips fit snug on the end. 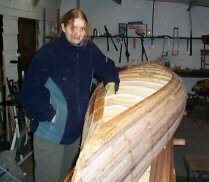 06/04/03 - It started to take shape after a full days work on it. 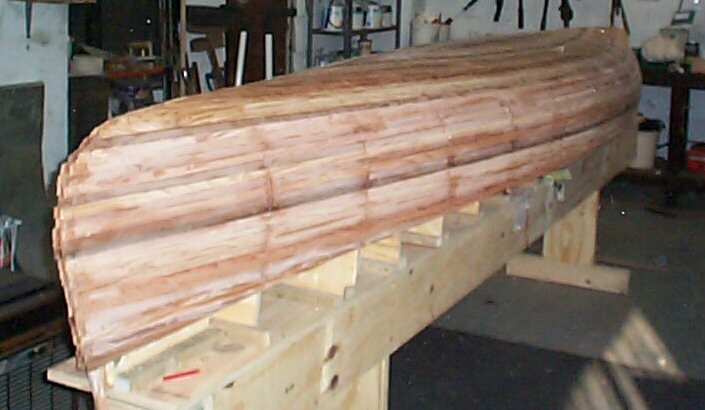 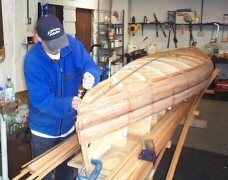 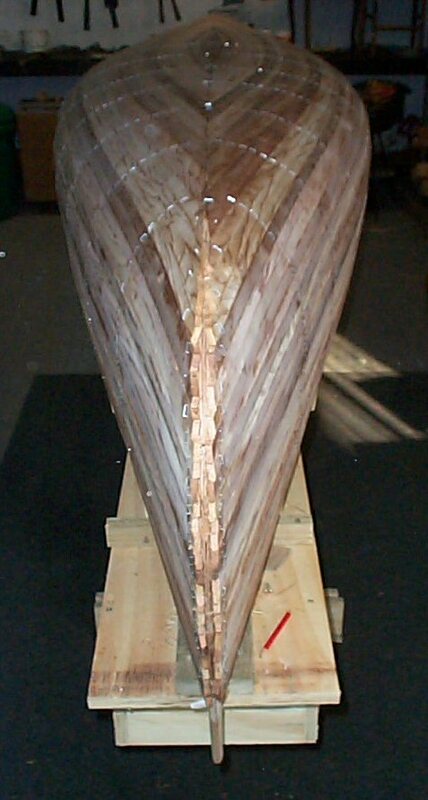 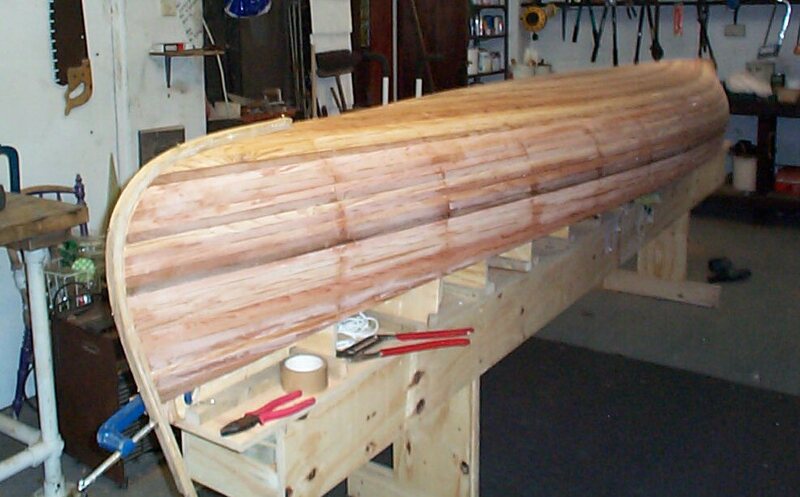 14/04/03 - One side of the hull is planked in. 16/04/03 - Each Piece of wood now has to be cut to fit. 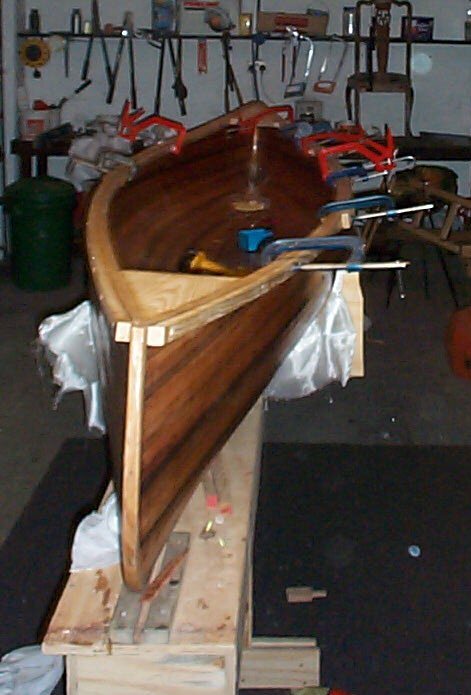 This seem to be taking its time. 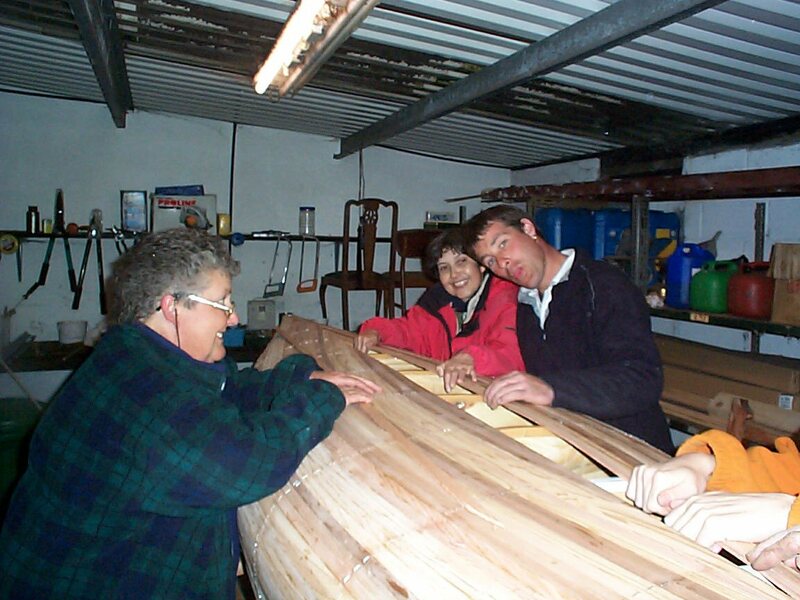 20/04/03 - The Final Piece has been put into place after a couple of hard day work. 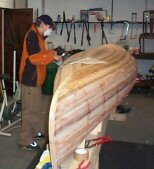 We then cut the sides to make the curves of the sheer-line.. 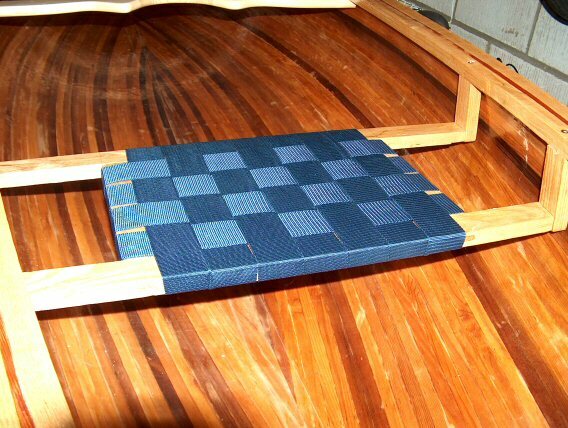 Here you can see where we have tried to match the colours up. 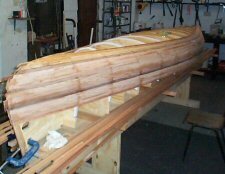 Here we have filled in all the little gaps and now start to look like a canoe. 4/5 May - Finally finished sanding. 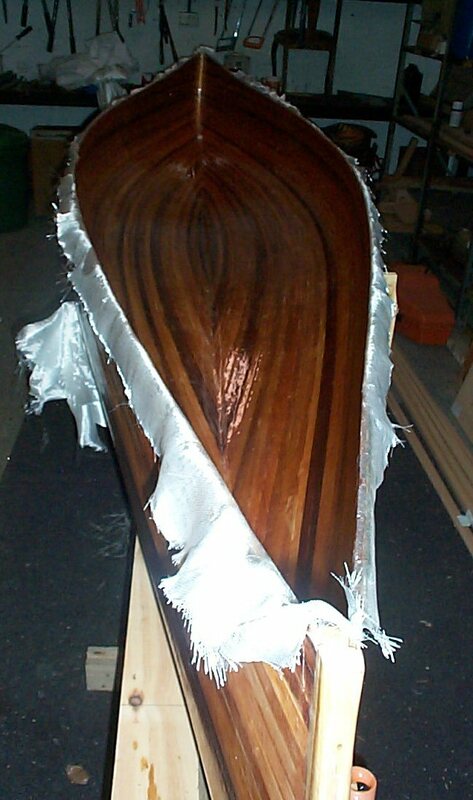 Put the fiberglass cloth and first coat of epoxy on. 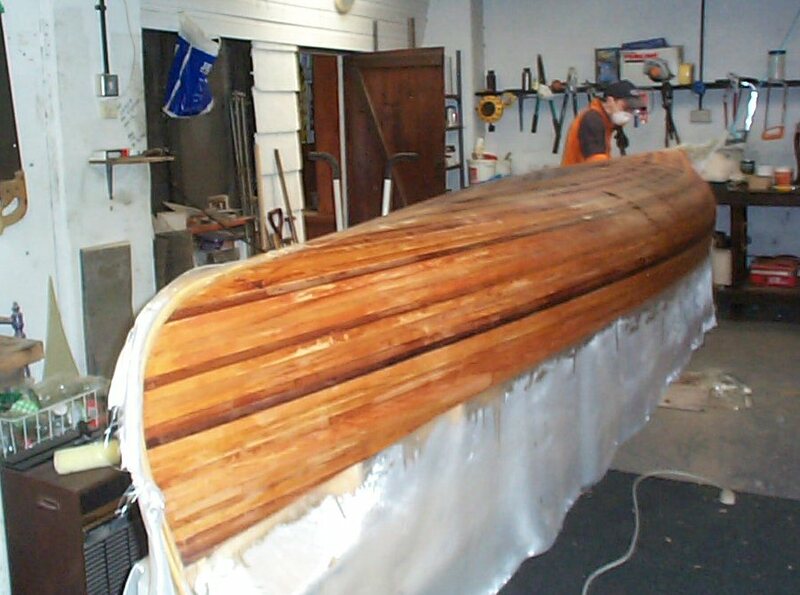 After 6 hours waiting the second coat is applied. it starting to look good. 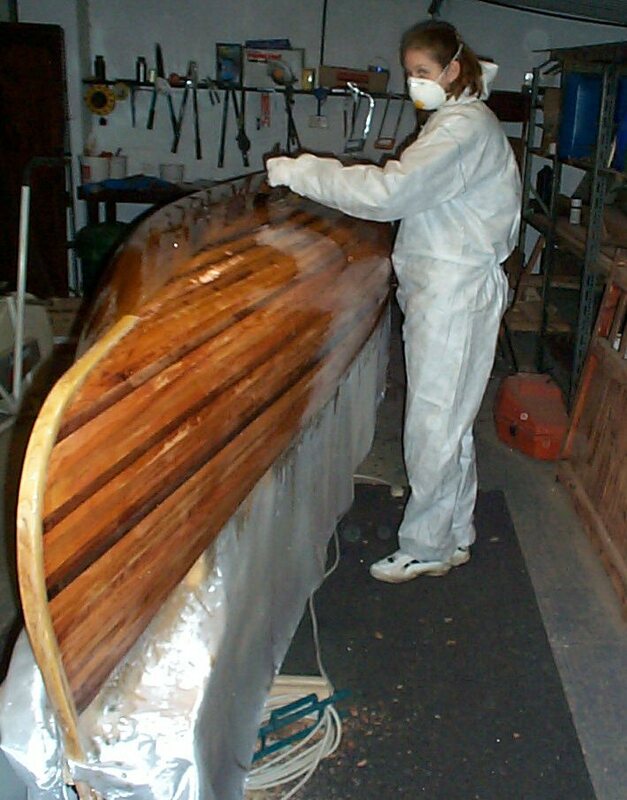 Last Coat of epoxy applied. Just just trimming to fit and to varnish it. 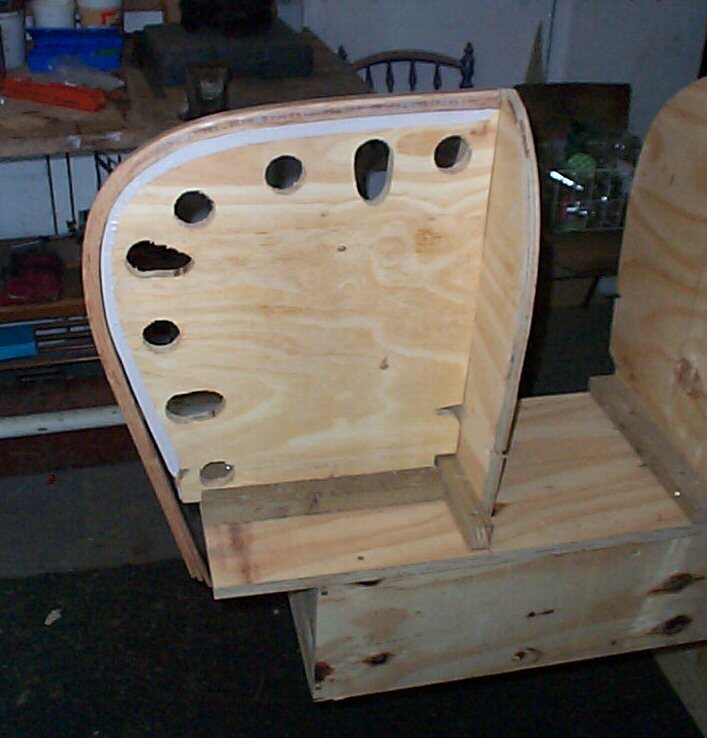 Here my first attempt at making the seat with Mortice and Tenon Joint to join the pieces of wood togther. 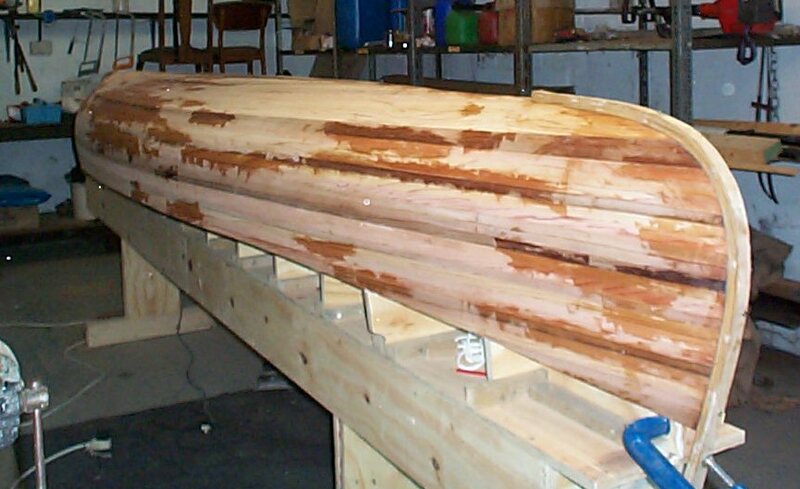 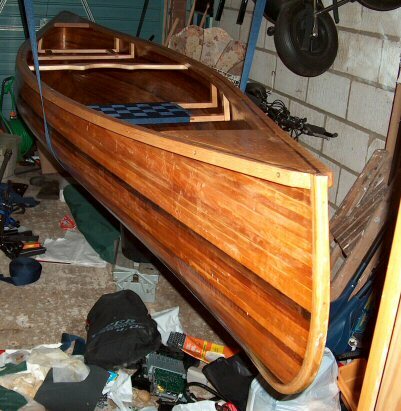 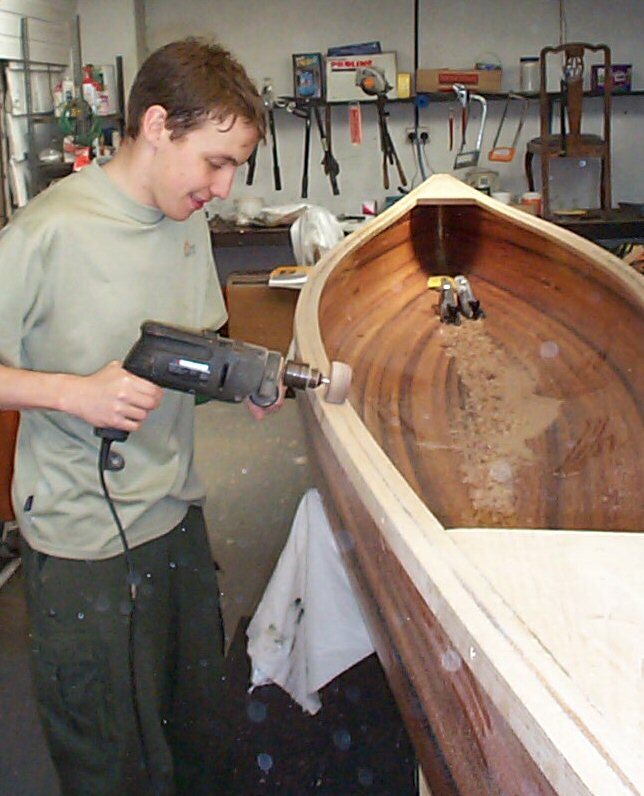 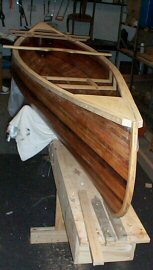 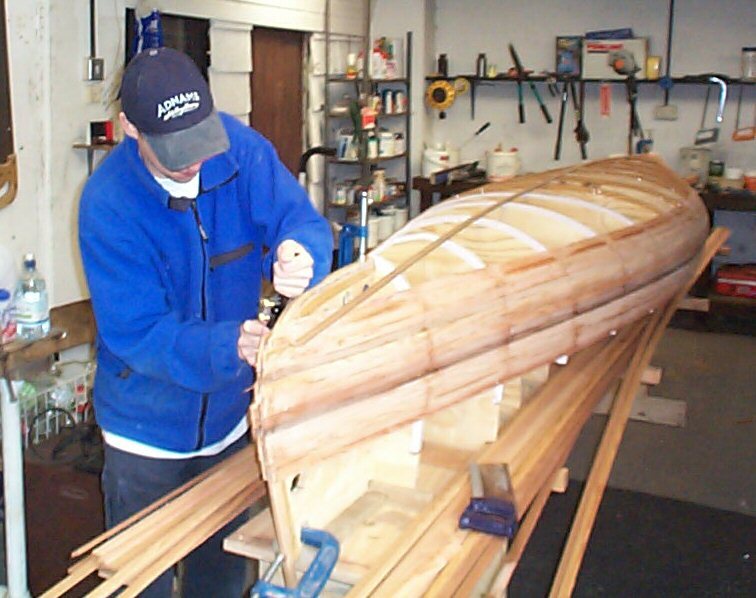 18/05/03 - We have planned and sanded the gunwales and decks.